ACCEPTING CONSIGNMENTS NOW - Contact our office at (607) 865-6951 to sell your guns today! Contact us to consign your individual items or full collections! 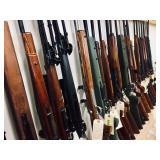 Rifles, shotguns, & handguns plus all kinds of firearms and outdoors accessories from multiple estates and other consignments. Auction includes a large amount of Long Guns & Handguns including Remington, Mossberg, Browning, Savage, Weatherby, Ruger, Smith & Wesson, Thompson Center and much much more! Includes Everything from Antiques, Collectibles, and Rare Calibers to Modern Firearms. Preliminary List Below, many additions to come, check back soon for additional details! Winchester 67 .22 S,L,LR SN: No SN. Asst Tools for Reloading Misc. Manufactors Plastic hammer, die brushing, shell holders, etc. Asst. "Stuff" for Reloading and cleaning Bullet trays, new wire burshes, load labels, 12 .22 dummy rounds etc. Asst. Tools and Lube for cleaning guns and brass Bbag for lube and powders for cleaning, 1 for Rifle, 1 for pistol. Asst. Tools for trloading Hornady and Lyman conversion kit, powder cap, decapping pins etc. Box of 100 reloads 308win H.P. Box of 50 Asst. 308win 30 rounds with TAC, 20 rounds H.P. Contaners of Pistol Casings 45,380,9mm, etc. LEE Reloading Dies 357 mag. Solid Wooden Box on castors, wood frame. Preliminary List ONLY - Check Website for Updates & Additions!